The tough and versatile Agapanthus plants sold today are mainly hybrids, easy care and very few problems. It is interesting to note that evergreen, semi evergreen and deciduous varieties are all available for sale. And spring is when you should plant hem, the soil is warming up and they will settle in nicely before the next winter. Used widely as architectural and filler plants, often found lining pathways. We are all used to the tall blue flowering varieties, however today we have near black pants, white, multi coloured and of course the low growing or 'dwarf' cultivars. They do make great cut flowers and Agapanthus have few real problems other than self seeding, and this is overcome with some of the sterile varieties now offered for sale. A strappy leafed low care evergreen or deciduous plant with flowers on tall stems. Bulbs or more correctly the agapanthus rhizomes root masses, are readily available for sale in the UK , as are seeds of species. Agapanthus africanus are popular, however agapanthus come in many forms and colours including dwarf forms, white and blue. 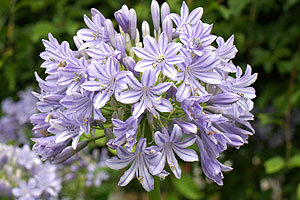 Miniature agapanthus are also available, low growing and useful in the border. Sterile plants that will not sell seed are also on the market. Agapanthus campanulatus 'Isis' (pictured right) is a slightly smaller growing deciduous plant with open flower heads of mid to deep blue. Deciduous varieties tend to be a little hardier in cold climates. Agapanthus are generally happy growing in part shade to full sun. They prefer a free draining soil and do not like to grow really boggy conditions. Agapanthus are a tough plant, great as borders and can work well in landscaping schemes. Tall flower heads above glossy green foliage. A tendency to spread though seeds can be an issue. Agapanthus are very easy to care for, remove or 'deadhead' spent flower heads to tidy up the plants and prevent self seeding. Pruning is generally not required, large clumps can be divided to improve flowering performance. Problems In deep shade they may not flower. Subject to foliage damage in heavy frosts, although they recover. Pot bound or older congested clumps may not flower as well, so may need to be divided. Remember that some are evergreen such as A. africanus and some deciduous A. campanulatus and Agapanthus inapertus or 'drooping agapantha' are two. Agapanthus 'Glenavon' with its large flower heads, is a mid blue colour with a white strip on each petal for a little contrast, and is one of many varieties available from Fairweather's in 9cm or 2.5 litre pots. Fairweather's are Europe's leading growers of Agapanthus, holding a collection of over 300 varieties, collected over the past 10 years. 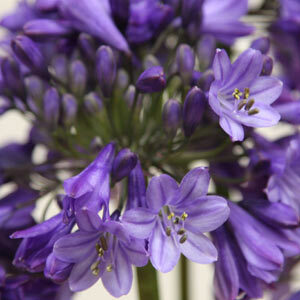 They are at the forefront of introducing new Agapanthus cultivars which have been bred in the UK. Agapanthus are available for sale from the following growers. Hosts . 100 Agapanthus varieties, 25 Phormium, 80 Crocosmia, 42 Rhodohypoxis, plus Trilliums and more.